I Have Glasses. Will My Child Need Them Too? A question we often get from parents at Doctors EyeCare is “I have glasses. What are the chances my child will need glasses?” A lot of research has been done to find an answer to this question and so we’ll summarize the studies here as accurately as possible. 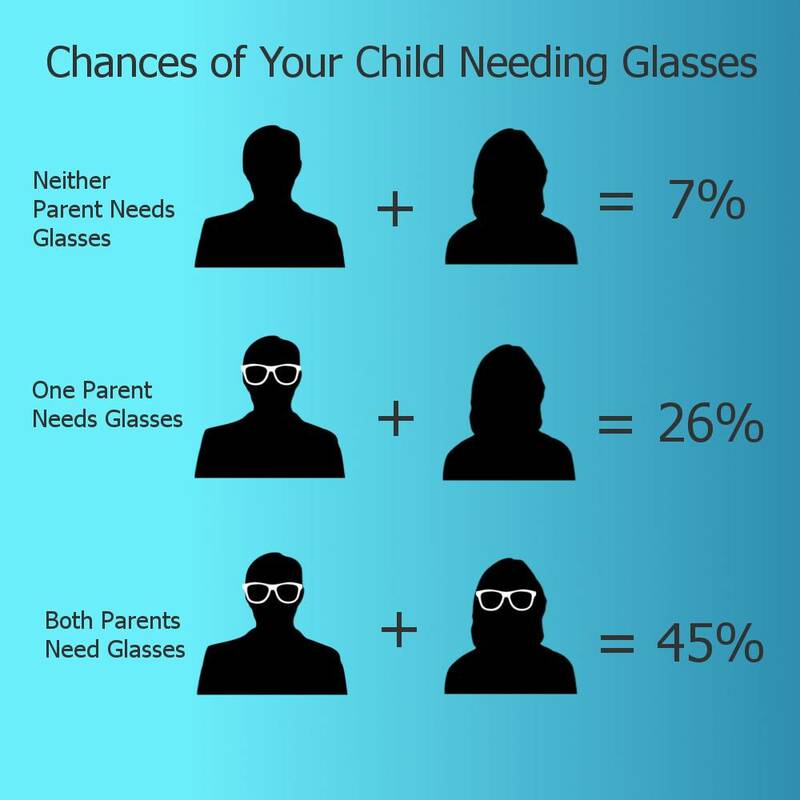 If only one parent needs glasses for near-sightedness (called myopia and means you can see well up close but not in the distance) and the other parent does not need glasses, the chance of their child being near-sighted is 26%. If both parents are near-sighted, the chance of their child being near-sighted is 45%. If neither parent is near-sighted, the chance of their child being near-sighted is 7%. In the studies, they found that almost all of this influence from the parents was due to genetics and that it was NOT from the environment or how the parents and children used their eyes. These are rough numbers and can definitely be affected by other factors such as the severity of near-sightedness. For example, two parents that are both -10.00 are much more likely to pass that on than two parents that are -1.25 each. Other studies have shown similar results for far-sightedness and astigmatism. Young TL, Metlapally R, Shay AE. Complex Trait Genetics of Refractive Error. Arch Ophthalmol. 2007;125(1):38-48. doi:10.1001/archopht.125.1.38.